Bananas are graded according to the color of their skins. 1 Is Eating a Banana With Brown Spots Bad for You? 3 Are Bananas Safe to Eat if the Skin Is Dark Black or Brown? 4 What Happens to Bananas Dipped in Lemon Juice? The skin of a banana protects its tender flesh from impurities and is a clear indicator of its ripeness. As bananas ripen, the starches they contain turn to sugar, which deepens their sweet flavor. Refrigerating them slows the ripening process, giving you some leeway if you can't use them right away. As bananas ripen, enzymatic action changes their starches into sugars, and the ordinarily white creamy flesh gradually turns brown. The bright yellow skins actually indicate bananas that haven't ripened completely, which is also reflected in the firmness of the pulp and its sometimes bitter taste. 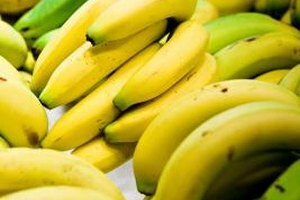 Exposing bananas to a temperature of about 40 degrees Fahrenheit slows the enzymatic action, and the bananas take longer to deteriorate. The flesh of a fully ripened banana is very brown and almost liquid in consistency, and despite its appearance, has reached its flavor peak. You can safely store ripe bananas in the refrigerator for up to seven days. To slow the ripening process down, refrigerate whole bananas unpeeled, with skins that are intact. Place them in the coolest part of the refrigerator, where it will take roughly two or three more days for them to reach the fully ripened stage. Don't worry if their skins turn completely black, because the inner flesh will still be white, firm and delicious and can be used like other bananas. Bananas ripen quickly at room temperature, and even more so during warm weather. 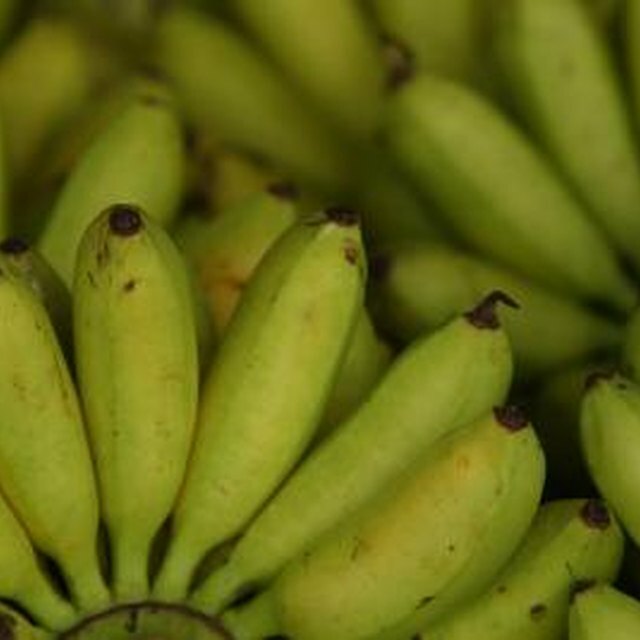 Help green bananas to ripen by placing them in a warm area in a brown paper bag, and put a ripe apple or tomato in the bag if they're not ripening quickly enough. At the grocery store, choose yellow bananas for slicing in fruit salads or eating out of hand. Buy fully ripe bananas with black spots on their skins for cooking, baking, beverages or any recipe that calls for mashed bananas. Rarely is there a need to throw out bananas at any stage of ripeness. Unless they show distinct signs of spoilage, such as mold, extreme mushiness or they have a decidedly unpleasant smell, you can freeze the pulp for later use. Peel and mash the bananas and store them for up to three months in freezer bags or containers in the portion amounts of your choice. To use for baking, thaw the bananas in the refrigerator before proceeding with your recipe. To use for smoothies and other chilled desserts, let them thaw for a couple of minutes at room temperature before blending with other ingredients. Still Tasty: How Long Can You Keep Bananas? What Are the Different Kinds of Bananas?